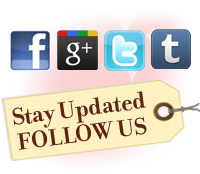 Did you know that your feet have very few oil glands compared to the rest of your body? It’s no wonder then that the lotion that you use for the rest of your body may not be enough to keep your feet hydrated. 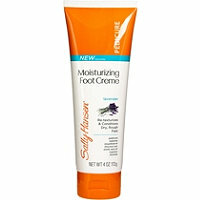 We tried Sally Hansen’s Moisturizing Foot Crème and loved the formula. A welcome surprise considering Sally Hansen is not necessarily known for their skincare. It’s thick and can moisturize even the driest feet. But it doesn’t make your feet so greasy that they slip around in your shoes. Our favorite thing about this Crème is that it contains anti-fungal tea tree oil – a must for a healthy pedicure. We’ve been seeing a lot of advertising for the new brand, Simple so we wanted to try it out. Simple is actually only new to the U.S. –it’s the #1 skincare range of products in the U.K. and has been there since 1960. Now Unilever owns the brand, which prides itself in being the first to create a cleansing product with no perfume or color. We tried their Hydrating Light Moisturizer, which has Pro-Vitamin B5, Vitamin E, and glycerin. Even better is what’s missing – perfumes, dyes, and irritants. At around $10, this may seem expensive for a product with just 2 vitamins. However, the bottle is generously sized and a little goes a long way. This was excellent for our sensitive skin and seemed to work better than our more expensive moisturizers as it reduced inflammation drastically (this makes your skin appear smoother). We were truly in love with the texture of our skin after using it, it just seemed healthier! 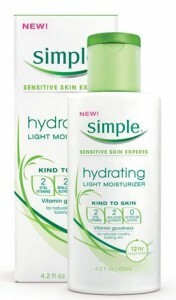 And since this is their light moisturizer, it does well in the heat or with oily skin. If you are using a lot of products to reduce the appearance of pores or to get smoother skin, you may want to try this one. We also recommend this for people who are using harsh exfoliants at night; Simple Hydrating Light Moisturizer will give your skin a break during the day. We’re pretty excited about the Simple line and look forward to trying more of their products. 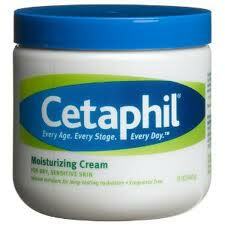 Cetaphil Moisturizing Cream, by Galderma Laboratories, was specially formulated for people with sensitive and dry skin. This cream particularly benefits people with eczema and psoriasis, but is also great for anyone with dry skin. We loved how well it moisturized our hands, feet and elbows. The cream doesn’t feel greasy or oily at all and is fragrance free (which is awesome for sensitive skin). The cream is a little pricey when compared to other lotions at about $12 for a 16 oz. tub, but its quality helps make up for the price. 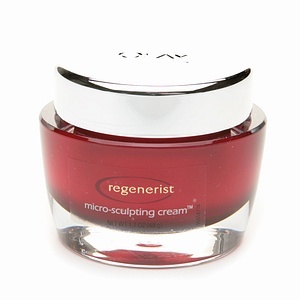 Olay Regenerist Micro-Sculpting Cream is different from other anti-aging creams in that it promises not only to diminish wrinkles, but also to tighten. This cream is said to firm sagging prone areas, smooth skin’s surface, and restore elasticity. We tried it and loved how luxurious the cream felt (which isn’t greasy at all). We thought the fragrance was a bit strong, but it’s also available fragrance-free. We found that it did all that it promised without getting in the way of our makeup. It’s a wonderful moisturizer and gives the skin a more youthful look. Of course, there’s no drastic ‘lift’, but it’s our belief that radical changes mostly come from a doctor’s visits. This is more expensive than many drug store moisturizers since it’s over $20, but the quality is comparable to department store brands. It used to be that most skin lighteners contained hydroquinone. However, in 2006 FDA proposed a ban on the over the counter sale of cosmetics with this ingredient that was so popular to reduce age spots and blemishes. So why the ban? Studies showed some evidence that hydroquinone had some cancer causing properties. 2010 studies also showed that there was a link between hydroquinone and ochronosis, a condition where the skin gets dark and thick. 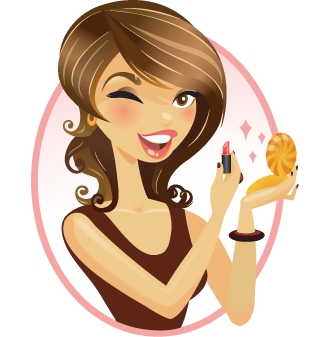 Skin care companies have since found alternate ingredients to use for skin lightening. 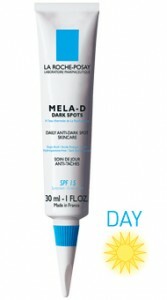 For example, La Roche-Posay’s Mela D Dark Spots contains Kojic Acid and LHA. You can use this as a daily moisturizer for age spots, sun spots, liver spots, and freckles. It’s also safe for sensitive skin. We tried this for a week and noticed a difference. We really liked that since it’s non-greasy we could use it in the morning beneath our makeup and at night. We noticed a nice improvement, but found that their other product, Mela-D Serum, gives faster results. If you haven’t heard of La Roche-Posay it is a skincare company that bases its products around healing thermal spring water. Their products are all designed not to irritate delicate skin so they are fragrance free and tested on sensitive skin. 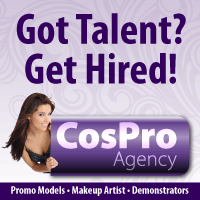 Here is a resource for those who have a passion for beauty and want to learn more.